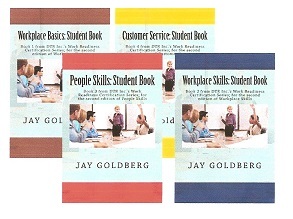 Jay Goldberg's best selling work readiness series continues to sell well on Amazon. Sept. 18, 2015 - PRLog -- On Friday night, September 18th, Jay Goldberg, CEO of DTR Inc. a business consulting firm specializing in developing workplace training programs; had five books in the top 25 in the training category on Amazon. The books are: Workplace Basics; Workplace Basics: Student Book; Workplace Skills; Workplace Skills: Student Book and People Skills. The other books in this four module, eight book series are People Skills: Student Book; Customer Service and Customer Service: Student Book. However, the sales ranking does not tell the entire story in regards to the actual sales on Amazon of Jay Goldberg's work readiness series. His sales are almost always for multiple books. For example a recent sale in the Cleveland area were for over 30 of the Workplace Basic books. Amazon's ranking treat a sale of over 30 books the same as a sale of one book at the time of sale. Currently, Mr. Goldberg is working on a new book that will detail his workplace training methodology he calls the DITHA Approach to Training. The book will be titled Training That Gets the Desired Results and will be available in October, 2015. To see the books available by Jay Goldberg at Amazon, check out his author page: http://www.amazon.com/Jay-Goldberg/e/B0083056QW.